Royal Stewart Tartan Ribbon, the Royal tartan of Scotland, is available to buy in 10mm (3/8"), 16mm (5/8"), 25mm (1"), 38mm (1½") and 70mm (2¾") widths on 25 metre (approx 27½ yard) reels. The Royal Stewart Tartan Ribbon sold by tartan-ribbon.com is top quality, authentic Scottish tartan ribbon as certified by the Scottish Tartans Authority. Royal Stewart Tartan Ribbon is also available in 7mm (1/4") width on 100m (110yd) spools. 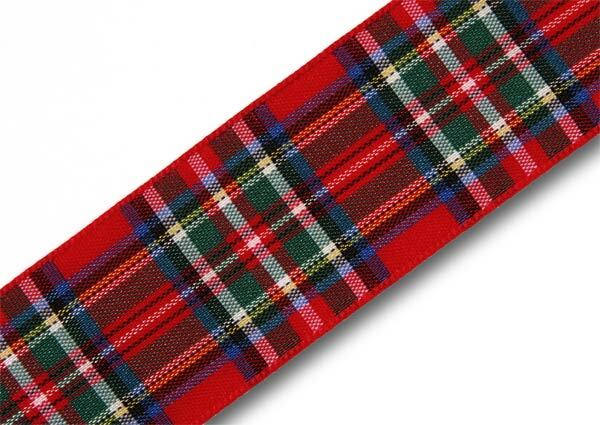 Royal Stewart Tartan Ribbon is also available in 12mm (approx 1/2") width on larger 50m (55yd) bulk reels. Please note that tartan ribbon supplied 50m bulk reels is from a different manufacturer and stocks are limited. 50m bulk reels offer unbeatable value for money. Royal Stewart Organza (sheer, lightweight) Tartan Ribbon is also available in 16mm (5/8"), 25mm (1") and 38mm (1½") widths, on 25m (27½yd) reels. The Royal Stewart Tartan Ribbon is probably the most instantly recognised of all Scotland's tartans with its regular, symmetrical overchecks set against a blood-red background. The Royal Stewart is the Royal Tartan of Scotland and the tartan worn by Her Majesty the Queen and members of the British Royal Family so, by extension, is also the British Royal Tartan. 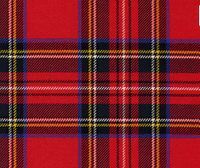 As subjects of the Queen, all UK citizens, all citizens of the Commonwealth and their descendants are entitled to wear the Royal Stewart tartan.